Hello, my name is Jayne Corso. I am a Community Manager for the American Evaluation Association (AEA). Pinterest is a wonderful tool for creating shopping lists and finding great DYI projects, but did you also know that it is a useful resource for finding interesting data visuals and info graphics? After all, Pinterest is a place to go to be inspired and to share ideas with others. In my initial post about Pinterest, I have listed some steps for starting your journey on the tool and finding ways to use Pinterest for motivation. Use the search bar at the top to search keywords focused on your interests. I suggest searching for data visualization, presentations, research, and evaluation. These keywords will pull images, info graphics, research examples, presentation tips, and much more, which have been pinned on Pinterest by other users. When you find an image you like, pin it to a board! 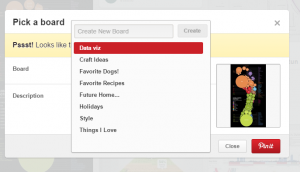 After you select pin, the site will prompt you to choose a board or create a new board. Now all of your related pins are in one place that you can easily reference. Similar to other social media sites, you can look people up by their names and follow them. When you follow someone, you get notified when they add items to their boards and their activity is shown in your news stream. Some of your favorite evaluators are already pinning on Pinterest including Kylie Hutchinson, Ann Emery, Stephanie Evergreen, and Chris Lysy. You can also follow boards. If you come across a Pinterest board created by a user that you find particularly fascinating, you can follow that board and you will be notified when something gets added. The greatest aspect of Pinterest is that you can be inspired by the work of others and keep a keen eye on trends within evaluations, research, and presentation. Pinterest encourages you to think creatively and find the best format for your evaluation or data. AEA is interested in joining Pinterest. Tell us in the comments if this is something you would enjoy and find as a useful resource for your evaluations and projects! We are using Pinterest extensively to track evaluation resources and to curate content and articles related to the programs we evaluate. We love it – it’s the easiest way to track information and easy to come back to later. See our pin boards at http://www.pinterest.com/improvegroup/.